Today's literature is plagued by sequelitis; plagued because many of the offspring are abominations. But here's a marvelous exception. Seventeen years after King and Straub's first collaboration, The Talisman, comes an immensely satisfying follow-up, a brilliant and challenging dark fantasy that fans of both authors are going to love. Page by page, the novel reads as equal parts King and Straub, with the Maine master's exuberance and penchant for excess restrained by Straub's generally more elegant (though no more potent) approach. But the book, far more than its predecessor, is set explicitly in the King universe, with particular ties to the Dark Tower series. Its primary hero is The Talisman's Jack Sawyer, now retired from the LAPD and living with no memory of his otherwordly Talisman exploits, alone in French Landing, Wisconsin—a town surveyed by the authors in an unusual third-person plural narration that buoys the book throughout. Terror stalks French Landing in the form of the Fisherman, who's been snatching, killing and eating the town's children. We know that the Fisherman is a resident of the town's elderly care facility, but Jack doesn't; when yet another child, Ty Marshall, is taken, Jack enters the hunt for the killer and the boy. He's joined by an array of locals, notably a gang of philosopher bikers and blind Henry Leyden, a 50-something cool cat whom every reader will adore. Jack is going to need all their help, and more, because The Fisherman is controlled by a malignant entity from End-World, where the Crimson King aims to unravel the fabric of all the universes. 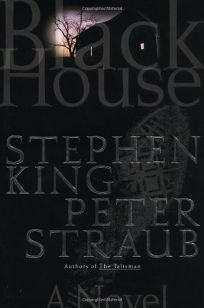 It's to blighted End-World, via the portal of the Black House—a creepy local house painted black—that Jack and others travel to rescue Ty, in the novel's frantic conclusion.